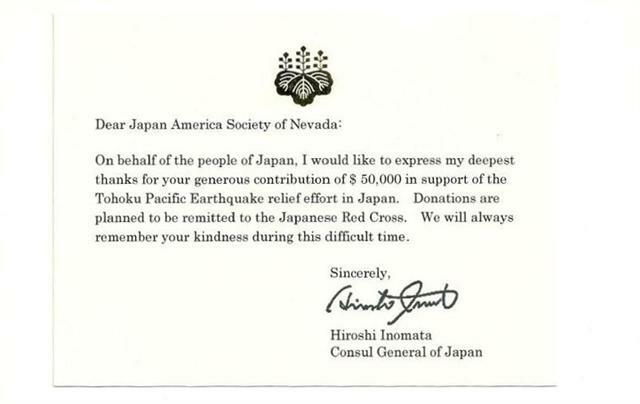 Honorary Consul General of Japan for Nevada in Las Vegas"
The suffering of the people of Japan caused by the recent devastating earthquakes and tsunami is hard to imagine, easy to underestimate, but impossible to ignore. 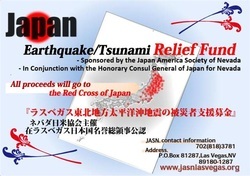 In its role as a bridge between Japan and Nevada, JASN is doing all it can to help the victims of these recent disasters to survive. 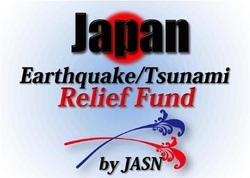 Please help us help those in Japan who are in unimaginable need. Your donation will help bring comfort and relief to those who need it most. The outpouring of sincere condolences, warm wishes and offers of aid from the residents of Nevada are so very much appreciated. 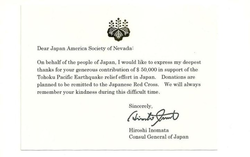 Thank you for your generous donations for emergency relief and recovery efforts in Japan. Your support at this time underscores how our community works together during a crisis. Thank you again for your support, prayers and wishes for a speedy recovery in Japan. Hon．Blakely has left the Condolence Book for the public to send their messages to Japan. The book is in the first floor lobby of the Grant Sawyer State office building, 555 E Washington in Las Vegas, across the street from Cashman Field (just off Las Vegas blvd north). Please do stop by to sign the book and express your support and encourage your friends and family to stop by too.